Mango butter is extracted from the seed kernels of the lush and juicy tropical mango fruit. The seeds render a firm butter suitable for cosmetics and pharmaceuticals. Exactly what is Mango Butter? Mango Butter is native to tropical regions and is now grown in both hemispheres. The parent species, Mangifera indica, is believed to have been cultivated for about 6,000 years. Mango butter is extracted from the seed kernels of the lush and juicy tropical mango fruit. The seeds render a firm butter suitable for cosmetics and pharmaceuticals. It is non-greasy, absorbs easily into the skin, and provides a natural protective layer against UV radiation. It has emollient properties and high oxidative ability. 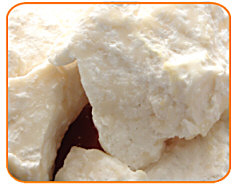 It has a high content of stearic acid which makes it similar to cocoa butter. Mango butter has good emolliency and lends protection against UV radiation. It is said to prevent drying of the skin and formation of wrinkles. Mango butter also reduces degeneration of skin cells and restores elasticity. Mango butter has natural emollient properties, high oxidative ability, wound healing, and regenerative activity due to its high unsaponifiable content giving it a high softening effect to the skin. It is said that Mango Butter provides improvements and benefits in the following areas. 100% pure Mango butter can be used with by itself or mixed into bath and body formulations. Suitable for soaps, cosmetics, toiletries and pharmaceuticals. Mango butter’s hardness makes it a great butter for stick formulations such as lip balm and lotion bars. Apply softened Mango Butter to the skin for superior moisturizing feeling. The butter melts at about 85-93 degrees Fahrenheit and works well as a liquid oil or as a smooth butter. I love mango butter. This one works great in lotions. I cannot apply it directly to the skin like some others because it is gritty. However, when I melt it down for lotions the grit does not appear in the lotion. When I melt it down and let it harden to a pure butter again, it is still gritty.